What’s So Good about Object-Oriented Java? Java is a way of programming using object-oriented programming. As an example, imagine that you’ve already written a computer program to keep track of the building instructions for houses in a new development. Then, the big boss decides on a modified plan — a plan in which half the houses have three bedrooms and the other half have four. Dig a ditch for the basement. Lay concrete around the sides of the ditch. Put two-by-fours along the sides for the basement’s frame. This would be like an architect creating a long list of instructions instead of a blueprint. To modify the plan, you have to sort through the list to find the instructions for building bedrooms. To make things worse, the instructions could be scattered among pages 234, 394–410, 739, 10, and 2. If the builder had to decipher other peoples’ complicated instructions, the task would be ten times harder. Starting with a class, however, is like starting with a blueprint. If you decide to have both three- and four-bedroom houses, you can start with a blueprint called the house blueprint that has a ground floor and a second floor, but has no indoor walls drawn on the second floor. 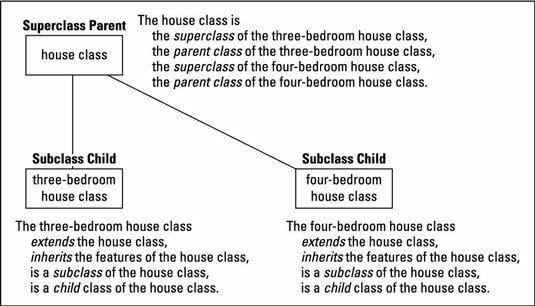 In the language of object-oriented programming, the three- and four-bedroom house classes are inheriting the features of the original house class. You can also say that the three- and four-bedroom house classes are extending the original house class. The original house class is called the superclass of the three- and four-bedroom house classes. In that vein, the three- and four-bedroom house classes are subclasses of the original house class. Put another way, the original house class is called the parent class of three- and four-bedroom house classes. The three- and four-bedroom house classes are child classes of the original house class. Needless to say, your homebuilder colleagues are jealous. A crowd of homebuilders is mobbing around you to hear about your great ideas. In the language of object-oriented programming, the Jacuzzi-in-living-room house blueprint still extends the original house blueprint. The Jacuzzi blueprint is still a subclass of the original house blueprint. In fact, all the terminology about superclass, parent class, and child class still applies. The only thing that’s new is that the Jacuzzi blueprint overrides the living room features in the original house blueprint. In the days before object-oriented languages, the programming world experienced a crisis in software development. Programmers wrote code, then discovered new needs, and then had to trash their code and start from scratch. This problem happened over and over again because the code that the programmers were writing couldn’t be reused. Object-oriented programming changed all this for the better (and, as Burd said, Java is “A Great Object-Oriented Language”).